In Berlin, decrepit structures do not always denote urban blight. Decayed buildings are incorporated into everyday life as residences, exhibition spaces, shops, offices, and as leisure space. As nodes of public dialogue, they serve as platforms for dissenting views about the future and past of Berlin. 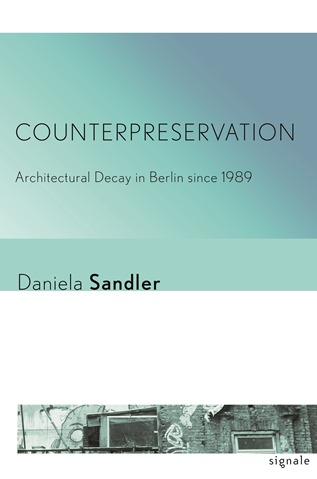 In this book, Daniela Sandler introduces the concept of counterpreservation as a way to understand this intentional appropriation of decrepitude. The embrace of decay is a sign of Berlin's iconoclastic rebelliousness, but it has also been incorporated into the mainstream economy of tourism and development as part of the city's countercultural cachet. Sandler presents the possibilities and shortcomings of counterpreservation as a dynamic force in Berlin and as a potential concept for other cities. Counterpreservation is part of Berlin’s fabric: in the city’s famed Hausprojekte (living projects) such as the Køpi, Tuntenhaus, and KA 86; in cultural centers such as the Haus Schwarzenberg, the Schokoladen, and the legendary, now defunct Tacheles; in memorials and museums; and even in commerce and residences. The appropriation of ruins is a way of carving out affordable spaces for housing, work, and cultural activities. It is also a visual statement against gentrification, and a complex representation of history, with the marks of different periods—the nineteenth century, World War II, postwar division, unification—on display for all to see. Counterpreservation exemplifies an everyday urbanism in which citizens shape private and public spaces with their own hands, but it also influences more formal designs, such as the Topography of Terror, the Berlin Wall Memorial, and Daniel Libeskind’s unbuilt redevelopment proposal for a site peppered with ruins of Nazi barracks. By featuring these examples, Sandler questions conventional notions of architectural authorship and points toward the value of participatory environments. Daniela Sandler is Assistant Professor of architectural and urban history in the University of Minnesota's School of Architecture.